During the recession, companies cut IT spending as they focused on cost reduction to stop the bleeding in earnings. Doing more with less, businesses put strategic projects on hold. 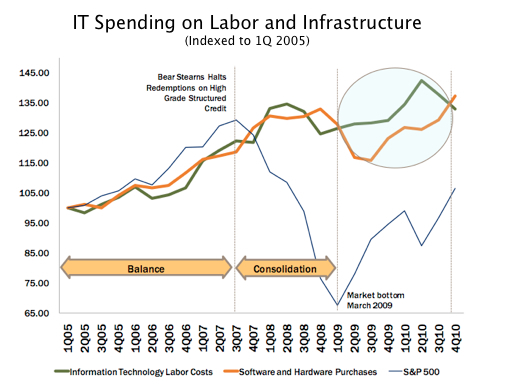 However according to the Maven Wave Partners IT Investment Index (the “MIT Index”), a new bellwether measure of investment in information technology spending, the IT spending squeeze is over. From its low in 3Q 2009 at the depths of the financial crisis, the MIT Index, representing aggregate enterprise spending on IT, is projected to increase by 16.9% to an all time high by the end of 2012. A new study released in connection with the launch of the MIT Index reveals that the gap between spending on tools and spending on headcount opened in 2Q 2009 and reached a 10 year high of 7.1% in 2Q 2010. However, by 4Q 2010, the gap had closed, signaling increased appetite for corporate spending on information technology through the end of 2012. “Strong Q1 earnings announcements from IT giants such as IBM, Intel, Microsoft and Oracle support our findings that, despite the largest ‘IT squeeze’ we’ve seen in years, spending on hardware and software is back in 2011,” said Farrar. 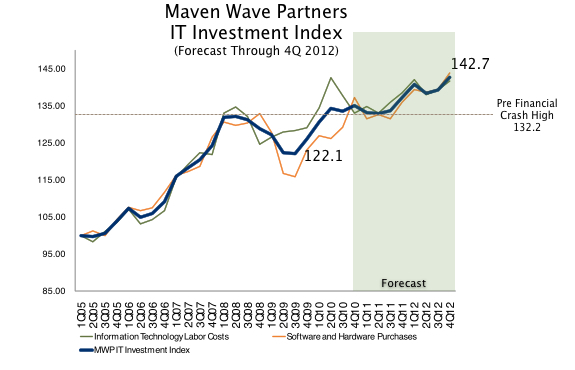 For more information on the Maven Wave Partners IT Spending & Investment Study please visit http://www.mavenwave.com/download-1q-2011-mwp-study/ or contact Matt Batt at matt.batt(at)mavenwave(dot)com. Maven Wave Partners provides management consulting, technology delivery and outsourcing services to companies that seek exceptional business advancement through transformation. Maven Wave hand picks the top business and tech savvy talent based on the unique client needs and is focused on delivering the entire chain of consulting services, from strategy to implementation to operations and results management. The management team of Maven Wave Partners has successfully delivered for a wide variety of clients across several industries, including both mid-market and large scale corporations. For more information, visit http://www.mavenwave.com.